Two Wheel Tractors, Motor Mowers and Sickle Bar Mowers are small and versatile little machines that are designed for easy and efficient ground care maintenance and cultivation. 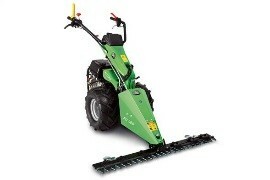 Riko UK is the sole importer for MGM Lampacrescia motor mowers, 2 Wheel Tractors and Moto Cultivators / Rotovators. Two Wheel Tractors, Motor Mowers and Sickle Bar Mowers are small and versatile little machines that are designed for easy and efficient ground care maintenance and cultivation. Two Wheel Tractors consist of an engine and transmission running a gearbox that drives the wheels and whatever implements attached to it. The PTO provides power to the implement. 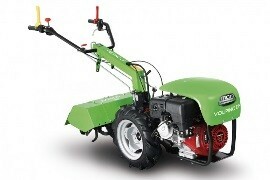 The “power unit” (Two Wheel Tractor without any attachment) comes in various sizes and horsepower. Like any tractor it can power all sorts of implements from Rotary Mowers, Rotovator or even Rotary Driven Ploughs and Snow Blowers. There is a wide range of petrol and diesel engine that you could choose from depending on your needs and use for the Two Wheel Tractor. The smaller models have what is called a “fixed axle”; this means that both wheels are on a solid axle, which makes them a little harder to turn. For this reason the larger, heavier models have a ‘differential’, this means the two wheels can turn independently of each other making turning far easier. Models with a differential have a ‘differential lock’. This does exactly what it says, locks the differential so the two wheels are effectively on a solid axle, this increases traction and helps keep the tractor traveling in a straight line. The smallest models have 1 forward and 1 reverse gear, as the size of power unit increases so does the number of gears available, so the largest machines have 4 forward gears and 3 reverse gears. As a rule, most Motor Mowers or Sickle Bar Mowers are dedicated machines intended for use with front mounted implements, i.e. pushing the implement. On Two-Wheel Tractors the handlebars can be turned through 180º so you can pull or push implements. On most of both types of power units the handlebars can be adjusted for height and can also be slightly offset to the left or the right of the power unit, this is helpful when working on slopes, against a hedge or when cultivating, i.e. you are walking on the untouched ground rather than what you have just cut or cultivated. 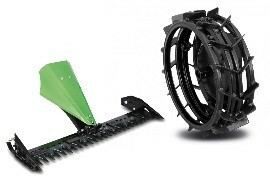 Most models can be fitted with brakes, the models with a differential can be fitted with a brake on each wheel, this means you can use the breaking effect to help steer the power unit, again very helpful when working across a slope or when working in heavy soil or heavy scrub / long grass. What is a 2 Wheel Tractor? It’s a single machine, with petrol or diesel engines, with a gearbox driving two wheels, which can be fitted with a multitude of attachments. In fact there are over 50 different attachments. So next time you go to use your lawn mower and see is sitting in the shed next to the Strimmer, Rotovator, Chipper, Scarifier, Rotary Driven Plough, Snow Thrower, Tipping Trailer, Wheel Barrow, Cylinder Mower, Scrub Mower, Rotary Mower, Drum Mower and all the other machines, you should consider that it may be time to get in touch with Riko UK and find out just how versatile a 2 Wheel Tractor can be, and how much money you can save! If there is one mistake people make, it is not considering potential future work you may wish to do and, as a consequence, not buying a model with enough horsepower. There is nothing worse than 3-6 months down the line wishing to buy a certain implement and finding out you don’t have enough horsepower! Make a list of work / implements you need and might need in the future. Petrol engines cost less than Diesel engines, so you get more horsepower for your money. Diesel engines use red diesel (much cheaper) and have lower fuel consumption, they generally have longer service intervals and a longer life span. However if you do not use the machine sufficiently it can take a long time to recover the additional purchase cost against the fuel saving. Re-wind petrol engines, large or small, are easy to start, however an electric start is a nice luxury. Small diesel engines are re-wind and take more effort to start. Large diesel engines can be re-wind or electric start. If you choose one then you need to be used to starting this type of engine or better still, chose one with electric start. If you are working to a budget, then aim for a machine with a higher horsepower petrol engine instead of a diesel engine. Take a careful look through our comprehensive price list and if you need to discuss any points requiring guidance or to arrange a demonstration you can contact us by fax, e-mail, or phone. Alternatively if you are happy with your choice you can phone, fax or e-mail your order, we will issue a proforma invoice for you to approve giving a full breakdown with the total price payable and the delivery details. By using the correct connection, the motor mower / 2-wheel tractor can be used to power anything that you would usually expect to find with its own engine of between 5hp and 13hp. If you have any attachments that you would like to power with one of our power units, contact us. The following are common attachments, divided into three categories, we can supply you with. Confused about models and application? Two-wheel tractor should be treated as just that, like a normal tractor they take numerous tools that enable them to carry out many varied tasks. They are able to push or pull numerous implements whereas Motor Mowers are called this because they are predominately used for mowing applications therefore they are designed to push implements along. Unlike the 2-wheel tractor the top gear cannot be used for towing a trailer. With either machine the most relevant factor to remember is Horse Power, it is the HP that tends to govern the size of the machine that will perform the tasks required. In basic terms this simply means the higher the HP the more varied the choice of attachments, obviously a high HP machine can also work quicker due to the use of larger attachments. The only exception to this rule is the finger bar mower, sometimes known as a sickle bar. These attachments have a relatively low power requirement for there given working width, this is easiest illustrated by a 5.5HP machine comes with an 90cm cutter bar, whilst an 9HP machine has a choice of 115cm up to 150cm cutter bar. With both machines it is rarely necessary to use maximum engine revolutions. The reason for this being that the cutter bar has a series of blades all cutting like scissors and they cut the material at a given height, this being set by adjusting the skids found towards the end of the cutter bar on either side.